Here's a bunch of frequently asked questions, that should hopefully answer your questions before you decide to ask something that has already been answered. The Skyrim Special Edition version can be found here. Q: Do I need to use the .esp? 1) You're modding wrong, you should never have that many mods installed. 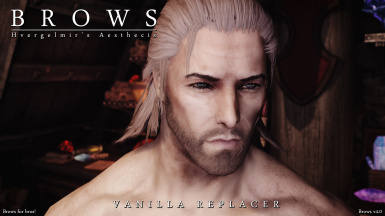 2) If you absolutely must, you can use xEdit to merge minor mods together (such as this one, with, for example Beards and other similar mods). Q: Can I get permission to use your brows on a follower mod of my own? A: Please refer to the permissions section under and read carefully. But the short answer is yes. Q: Can you make eyebrows match hair color? A: They already do, if you have enabled the Brows.esp you'll have a wide range selection of eyebrows that comes in vanilla shade, darker shades and lighter shades (to match hair color). 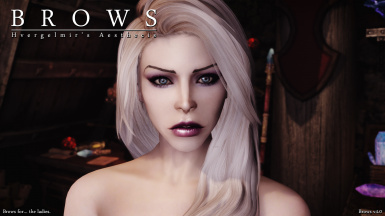 For one week, counting today I'm hosting a competition over at my Discord channel, to have the best Brows related screenshots featured on Brows as main pictures in the gallery. If you want to participate, head over to my Discord server for more information. Dear Hvergelmir Mod friends. Don't worry, 4.0 is also coming for legacy Skyrim, although I don't actively support legacy Skyrim any more. I hope to have a release ready very soon, stay tuned. May i have your permission to port your excellent mod to the Special Edition? It's for personal use only, of course. I appreciate you asking for permission, to port the mod to SE for personal use. Many people have however already done it for their own personal use and as long as it's just for you, I don't see any problem with it. 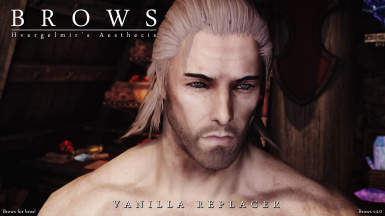 I am releasing a proper release for SE within the next few weeks however. Looking forward to your conversion. Can I use this for Special Edition? If yes, how? Would love an SE port as well! Haven't found any brow mods for SE that look this good, and I'm no good at porting mods over to SE (tried, and failed miserably). Technically this works absolutely fine with SE, but I'm coming out with a new version soon. couldn't you just make an optional version as in add your designs in without replacing the vanilla as an option? No. 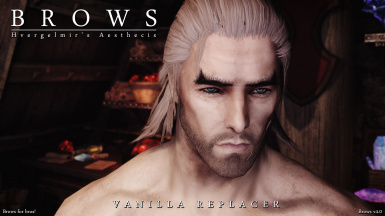 These look significantly better than vanilla brows. anyone know why the eyebrows seem to clip/sink into the head closest to the nose area? im using the ningheim race, have the correct addon. Vampire maybe? after character creation its fine but after a couple hours this happens. I haven't noticed this with the Ningheim race female I've been playing. i was playing around with racemenu sliders and not sure what i did but its working fine now. I think its got something to do with the demoniac oily body/head that i replaced on the toon i made. I made a oily head cause it just looked stupid. i believe thats what caused the eyebrows to not line up on the face right. All good now. 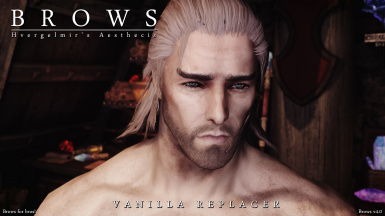 Good mod. Its staying permanantly. @ Hvergelmer... Anyone ever tell you that you look just like Braun Strowman from wwe wrestling? Holy [email protected]#%. Closest ive ever seen. Cool. I've heard that. I didn't know who that was until someone started mentioning it. And I'm honestly not a fan of that comparison. I look nothing like the guy. Didn't mean to offend you. I only mentioned it being he's one of my top 5 idols. And I noticed similarities. Hair, beard. Anyways, I apologise. No worries. I've just heard it way too many times (not on here though). To the point it started getting annoying. Really digging the look of the additional brows -- thanks for the mod!! u will either crash if u messed up the meshes, or get black face (which usually includes a crash) also if u dont resave the esp in the CK u can get a crash, and LOOT and if u use MO2 and/or Wrye Bash won't function properly, eg: loot will screw up load order if a mod is Form 43. Usually wrye bash will have a pop up when u open the mod in it to tell u it is old form. All my eyebrows are shiny/glossy. No idea why.